Roll in balls size of walnuts. Chill for 2 hrs or overnight. Bake in slow oven 275° – 45 min. Roll in pdwr sugar. 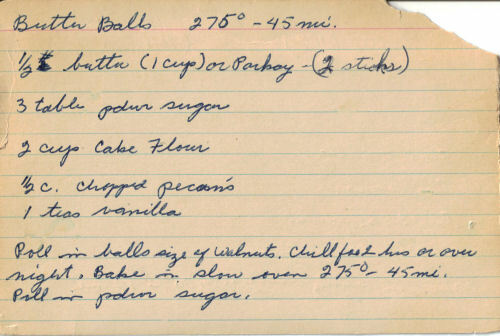 This is the first time I’ve seen my grandmother’s butter cookie recipe published anywhere. This is a very good cookie. We roll the balls in colored sugars before baking. Makes a crispy sugar shell. This was my mom’s recipe. I’m sure its her handwriting also. I’d be interested if you have any others with similar wtiting. I found one, her divinity recipe. Wonderful to see these.